Brad Street, Head of Winning Appliances Commercial, debunks common myths about the appliance and bathroom fitting selection process and reveals how the right appliances can add value to your development. Kitchens and bathrooms are the most important rooms within the home; alongside location they're the most significant considerations influencing the purchasing behaviour for new homeowners, yet surprisingly kitchen and bathroom finishes are often considered but then compromised on towards the end of a development. Product selection is critical in the context of the home and carefully chosen fixtures and fittings in kitchens, bathrooms and laundries can make a huge difference to buyer's expectations of the value of a property, whilst demonstrating a high level of finish by the developer. Ensuring that reputable brands are chosen on both kitchen and bathroom products is key for distinguishing your development, but unfortunately it's something that is sometimes compromised on. The reality is that consumers feel more comfortable buy​ing​ a property if there are reputable brands present​,​ as this provides peace of mind that the rest of the dwelling's inclusions are also of high quality. Cutting costs or installing unknown appliance brands could devalue your brand for future developments. Brand selection is key. Not only is it an opportunity to align your business with premium brands, it's also incredibly important for investors who are looking for quality. Premium brands are timeless, so when the investor looks to on sell and get a return on their investment, they will be thankful to the developer who chose the appliances and will sure enough be willing to buy from them again. Although investors may not be looking to live in the property, they will be looking for quality features that will appeal to the target market and bring a high rental yield. Selecting appliances that appeal to the target market is of paramount importance. For example, if you're appealing to the Asian market you cannot look past gas cooktops. Furthermore, if you're including larger three / four bedroom apartments, families will be your key demographic so child friendly products that make life easier, for example baths will be highly sought after. ​Taking all of these factors into consideration can have a significant impact on the success of your development. In our experience, ​projects that​ select high quality​ and well-respected kitchen, laundry and bathroom products ​enjoy record sale rates and ​many ​also receive national and international recognition from architectural awards. 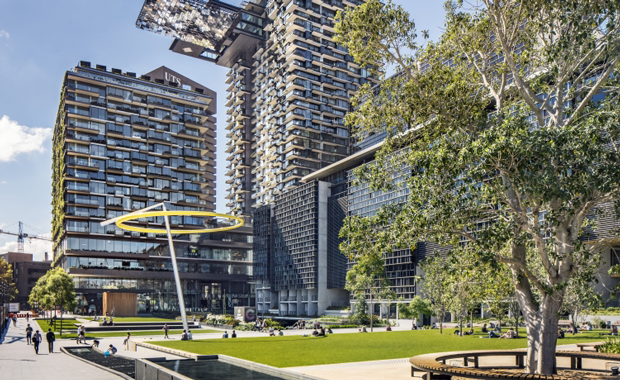 Image credit: Central Park Sydney - Winning Appliances Commercial provided the fixtures and fittings for the award-winning One Central Park development.